Well tonight I was listening to the American Digger Relic Roundup. I have to say that I have been listening to this radio show for the last few months and I enjoy the material that they bring to the table. Tonight they continued a discussion with the Director of archaeology at Montpelier, Matt Reeves. I was very intrigued by this show and enjoyed much of it. There were a few things that bugged me about it. Here ya go..
1- I think the idea is awesome and I would love to be involved in the program. Unfortunately it is a quite expensive program for the week. If I remember correctly it is upwards of $1,000. 2- When a caller posed the question of whether or not there were plans to expand the program the response was no. This just makes things seem elite. I would love to see manufacturers other than Minelab get on board with the idea of everyone working in harmony. I would love to be able to help out on a local level. 3- I have to wonder if the Montpelier project is getting as much archaeology attention as it is in the detecting community. I think if the archaeological community could see the benefits of having md’ers around it could start a change. If I happen to have an local and open minded archaeologist that views my blog; please take note that we as detecting enthusiasts would love to learn more about your processes and goals. Who knows maybe we can help each other fulfill a common goal. Well today I spent most of the day with the family doing stuff around the house. At about 4:30 my oldest son and I headed out. I decided to hit one of my “honey holes” that is tough to hunt due to the iron. I have mentioned this site in my blog several times and I feel blessed to have ongoing permission to hunt it. I have invited several area hunters to hunt this site and it just keeps on giving. Today’s finds were the deepest coin finds I’ve had here. 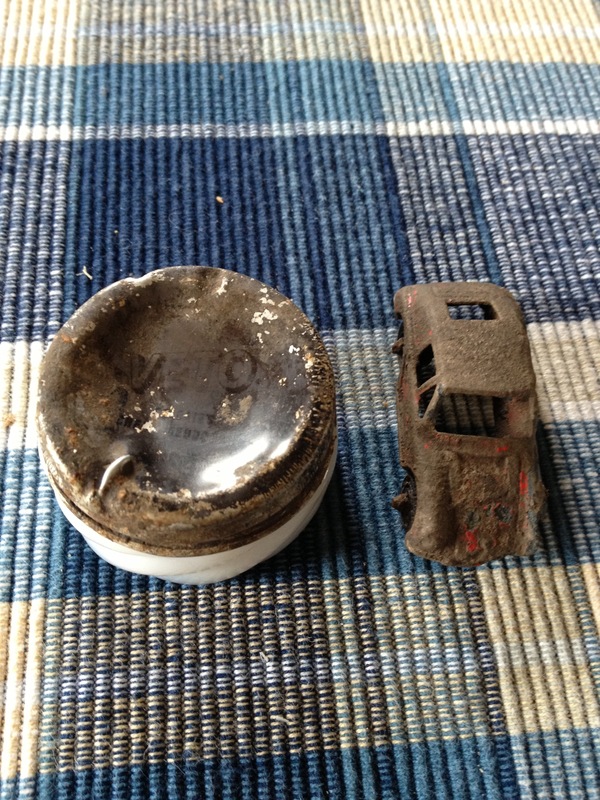 I’m not sure if it is due to the rain we’ve had or my removal of trash that led to my finds today. I know for a fact that this area has been swung over multiple times. About 10 minutes in I dug my first coin. a 1905 Indian Head Penny. This coin was at a good 7″. I continued on and got another good signal. Out pops a 1917 wheat penny, I scan the hole with my propointer and found the next coin a 1912 wheatie, i repeated the process and out came my second Indian of the day. The silver eluded me but I still had a blast with my Ace! Well tonight I want to write about some happenings that make me happy. O’Fallen Missouri passed an ordinance a couple weeks ago that required all items dug by those metal detecting to be turned into the city. Luckily many people who enjoy the hobby rallied together and they are going to go back and rewrite the ordinance to be sensible. This is the kind of stuff that we need to band together about. I’m glad that the political folks in O’Fallen took our words to heart and seem to be listening. I call that a success! Wheat State Treasure Hunters is now on Facebook. The group is hoping that this will enable our members to communicate outside of our meetings. Be sure to Like the group on Facebook for up to date information. We will announce meetings, finds, and hunt information there. Arkies and MD’ers working together.. This morning I decided to hunt “Silver City”. My main hunting grounds were congested with people celebrating the city. I decided to hunt another area that had houses on it at one time. My finds were a little on the slim side but I did manage a couple relics. Everything is coming together in the Wheat State! I wanted to take a moment to introduce our logo. It is more than a logo though. It help’s define us. The text says who we are, the wheat shows our roots, and the E Pluribus Unum represents our desire to gather Wichita hunters into one. E Pluribus Unum means “from many, one”. This little work was created by Jonathan Wood. He is one of the best designers in the Wichita area and I encourage you to check out his other works. I am sure you have seen his work at some point. Big thank you to Jonathan for helping us out on our venture. It’s much appreciated! Well, today we have had quite the weather change here in Kansas. Over the last weekend we had temps hovering in the 60’s during the day. Today that all changed and it was rainy, cloudy, and barely made it into the mid 30’s. That being said I didn’t get any detecting in today. Hopefully the weather will break for us tomorrow and I will get some swing time in. Pulltab Miner and I have been discussing taking a one day road trip and I am looking forward to it. 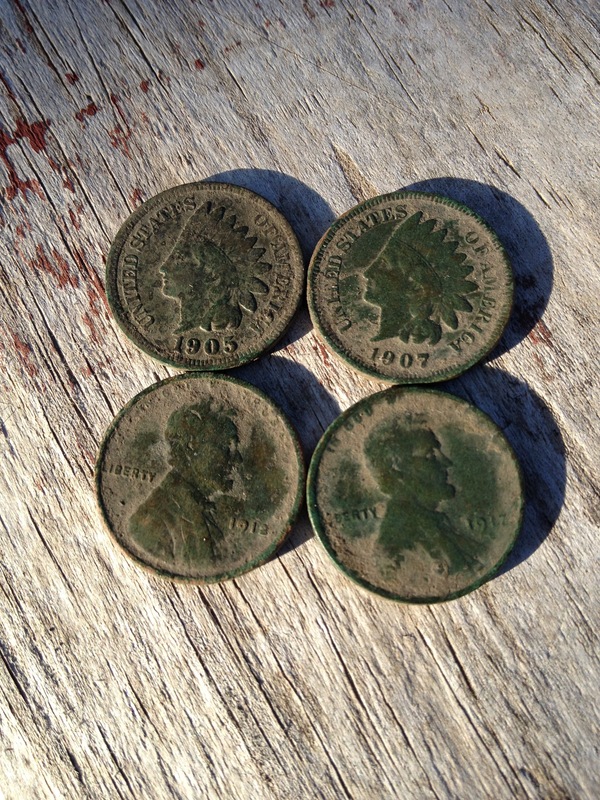 I have heard that the places we are discussing regularly give up very old coins (for Kansas anyway). I rode the bike home from work today and it was a balmy 37 degrees. I bundled up in my winter gear and the ride was fantastic. I have been riding year round for the last 4 years or so and thought I would make a list of my winter gear. I would much rather ride in the cooler weather than the 100+ temps that are just around the corner. Here is a list of my gear that makes the cooler temps tolerable. I don’t use electric heating devices and I have rode many many mornings that barely break into double digits. Happy scooting. Helmet– You would be amazed at how much a full faced helmet keeps you warm. Jacket– I have three different jackets I can wear that all have their pros and cons. Tourmaster Intake II- This jacket is by far may favorite riding coat. It is a mesh synthetic coat that has armor in it. In addition it has a rain/wind proof layer that zips into it, as well as a thermal layer that will zip into it as well. I can use any combination in cold weather and just the mesh shell in warm weather. High viz yellow construction coat- This coat I where when it is cold. It is high viz yellow with reflective tape. I love this coat mainly because of the high viz yellow. Day or night people see me faster and I stick out in traffic. Motorist may see me and chuckle but at least they see me. Long underwear– When on the bike I will wear a great pair of long johns from a company called Hot Chilly’s. They are lightweight but keep me warm when needed and cool when I don’t need the warmth. Some have called them my ballet pants but they work well all around. Gloves– I actually don’t wear glove much at all. I prefer mittens when it get’s cold. We have a great local ski shop that has all kinds of mittens and liners. I personally have gone through 5 or 6 pairs of gloves before learning about ski mittens. They work great! Balaclava– When it get’s cold I wear a Balaclava under my helmet. Mine covers the adams apple as well which helps tremendously. Wind layer– I have both rain/wind pants as well as a high quality rain jacket. Both of these items are a necessity when riding in cooler weather. All in all riding in cooler temps isn’t bad as long as you have the right gear. Layer up and feel the rumble. Well last night I had an opportunity to hunt a field that I have been researching and seeking permission to hunt for the last six months or so. This field has had activity on it since the mid 1870’s. It is a large field that is freshly plowed. The tenant that farms it will be planting corn soon. I only had about 45 minutes to hunt and I managed to find a couple goodies. I look forward to hunting this field as often as possible. The coolest part of the evening was when a man wanted to see what we were doing. He started telling me his 11 year old son had a detector. I encouraged him to attend a meeting of the Wheat State Treasure Hunters. Livestock band from a local farmer that used the field sometime in the past. I am the one keeping track of members of the group and noticed something that is neat. Out of about 25 people who want to participate we have 5 ladies. I have to think the Detecting Diva would find this satisfying. I hope that as the group progresses we see families and children getting involved. 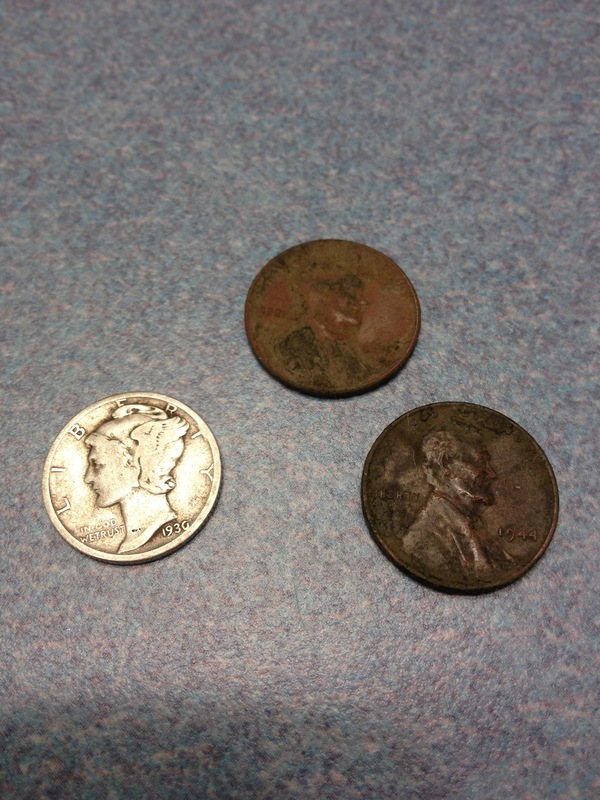 In this post I want to talk about the truths and honesty of metal detecting. I have been at this hobby for almost a year and a half. I have found what I feel to be a fair amount of good things. Lately though I am doubting some things. 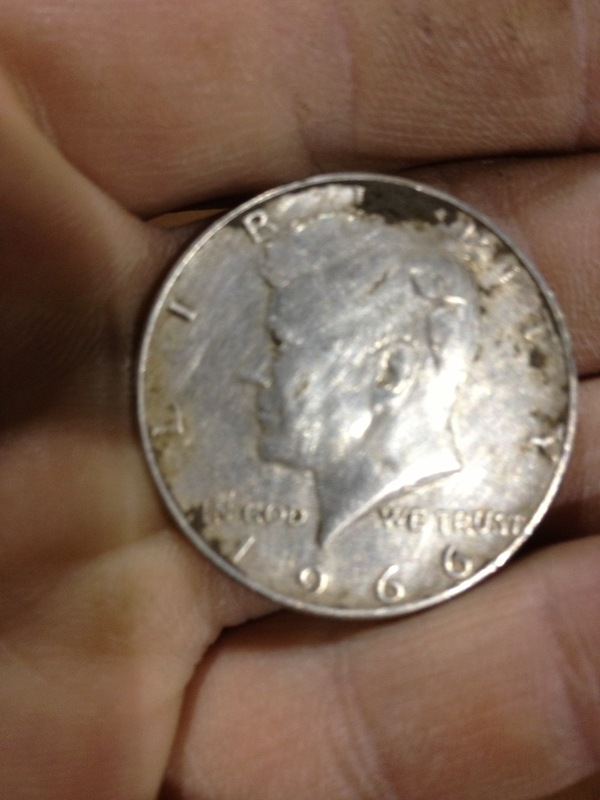 Last year I was amazed at one Wichita hunter who pulls silver coins quite consistently. I thought it was because of a high end machine. I now believe I was wrong. It is the fact that he knew his machine. For those of you that read Pulltab Miners blog he has recently been doing a fantastic job with his machine which he has named “Maurice”. He has had the machine for somewhere between 6 months and a year. A few months ago he learned something about it and now he is on a roll. Kudos to him for learning something different. I have seen videos on the net about people digging a target and being surprised it was a coin. Their detectors didn’t say it was a coin but it was. What I am starting to realize is that I need to have a more intimate relationship with my machine. I need to start digging deeper iffier signals. I have said it many times that I think the Ace 250 sees coins very deep even if it doesn’t register them as so on the display. We all should learn to hear what our detectors are telling us. That is the key that can close the gap between good signals and deep old coins. For Ace 250 users I know our machines are pretty honest in the top 6-7 inches. Deeper than that and I’m guessing the dialect changes.. I recently updated our blog. The leaders of the group have some really cool stuff cooking. Follow the group at http://www.wheatstatetreasurehunters.wordpress.com to be automatically notified when the blog gets updated! Well this weekend has been stressful, exciting, and exhausting all rolled into a little bundle I would call life. Friday night I went detecting at a little neighborhood park. It was all good until several teenage boys decided to make their presence known. It didn’t get ugly but they sure know how to ruin a nice tranquil hunt. In this particular park I have found all kinds of stuff and it truly is a mixed bag. I ended the night with a bunch of clad and a fair amount of trash. Saturday morning I had to start replacing the laminate on our counter tops and spent pretty much all day doing that. There was a short hiatus where the eldest Ukena boy had baseball practice and I managed to detect for about a half hour. I took $.39 for my efforts. Sunday started with me going to work for a few hours and then we had a family wanting to look at our house that we put on the market a few days ago. It seems as though we will have a contract written soon. This is all happening much quicker than I expected.. Anyways to celebrate I decided I would go hunt the “ol church”; It is a rural turn of the century church that has produced for me quite consistently. 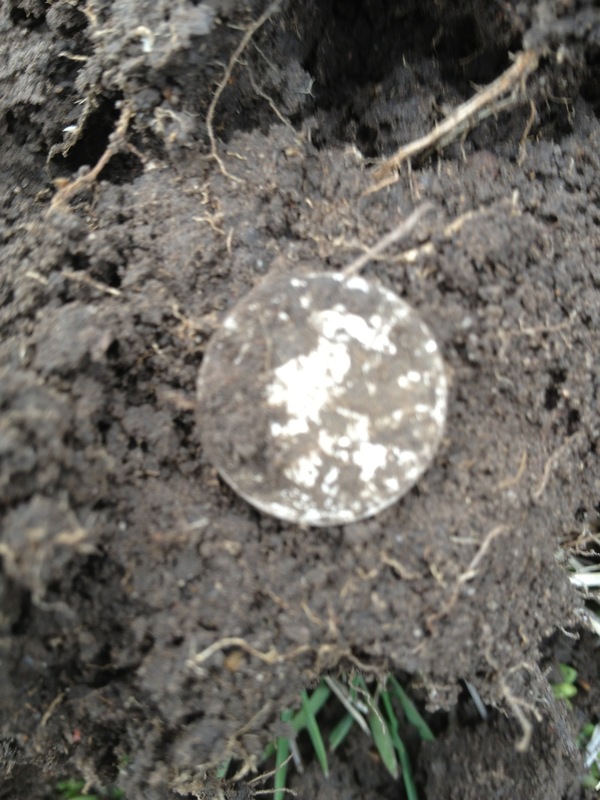 The second target I dug was a keeper in the form of a 1930 mercury dime. I feel blessed finding anything at this site because it is highly iron infested. 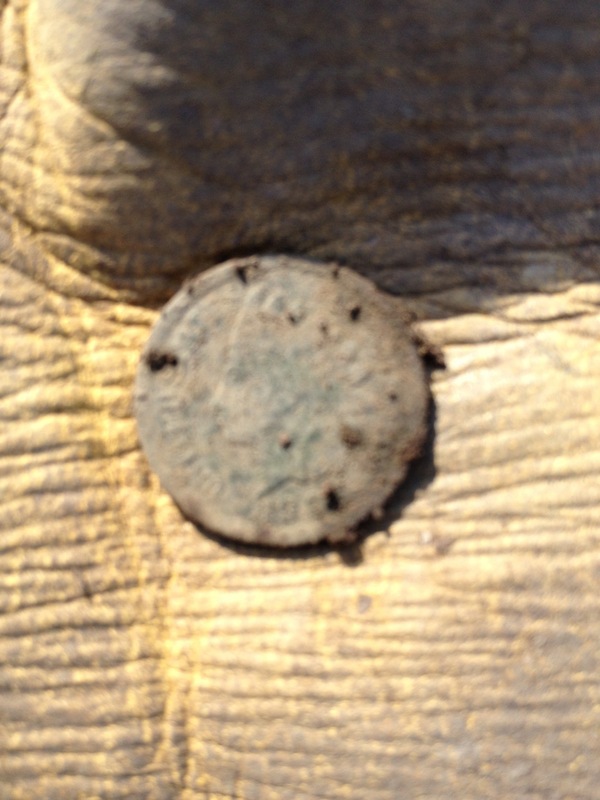 I know at least two detectorists have missed this coin in the past. I continued on and found a 1944 wheatie. This confirms my idea of a site never being hunted out! This is the same site I discussed in “mixed signals and mixed emotions”. Today I was talking to PulltabMiner and we decided that Linwood Park would be a good place to hold our first meeting. Be sure to join us for some fun on Cinco de Mayo. You can get all the information on the clubs site. We look forward to seeing old friends and making new ones. 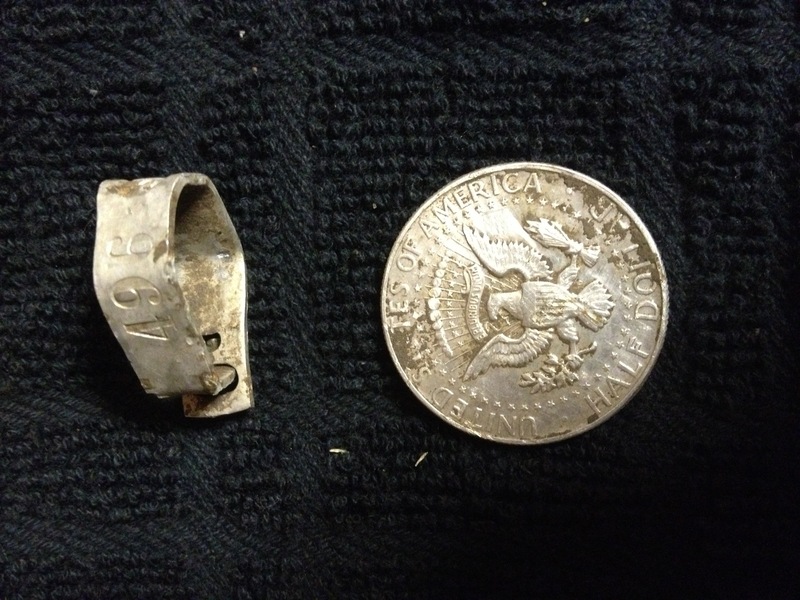 After much thought we have decided to start a metal detecting group for everyone in the Wichita Area. We have created Wheat State Treasure Hunters. We will keep the webpage up to date and active. You can check it out at www.wheatstatetreasurehunters.wordpress.com. I have been hunting with some of these guys for over a year and it is always a good time. I think as the group matures we will have a group full of fun, helpful, and always witty hunters. The group isn’t going to be like most MD’ing clubs in regards to it’s infrastructure. We won’t have a president, treasurer, or club politics and dues. We simply want to get together and talk metal detectors, theory, proper research, and finds. Our group hunts will not be formal either. A simple phone call or email asking who wants to join on a hunt will suffice. If you metal detect in the Wichita Area or have thought about getting into the hobby I hope you will join us. Happy “group” hunting and thanks for reading.